August 2015 – INDONESIA , Jakarta – Officials at a key North Sulawesi airport were forced to shut down operations on Sunday after a 1,580-meter volcano erupted on Saturday, sending ash into the skies and hampering visibility. 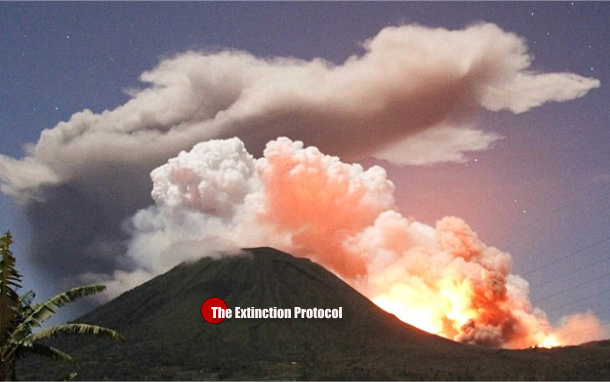 Mount Lokon erupted on Saturday at around 11.50 p.m. local time and gushed volcanic ash across northern and northeastern areas of Sulawesi, forcing officials to close down Manado’s Sam Ratulangi International Airport. This entry was posted in Civilizations unraveling, Dormant fault activation, Earth Changes, Earth Watch, Earthquake Omens?, High-risk potential hazard zone, Human behavioral change after disaster, Magma Plume activity, New volcanic activity, Potential Earthchange hotspot, Prophecies referenced, Seismic tremors, Signs of Magnetic Field weakening, Time - Event Acceleration, Volcanic Ash, Volcanic Eruption, Volcanic gas emissions, Volcano unrest, Volcano Watch. Bookmark the permalink.